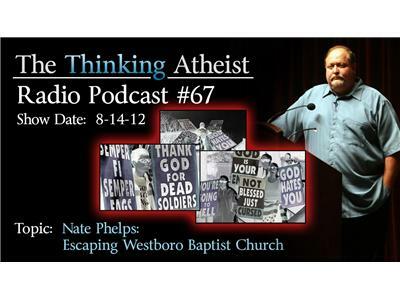 Nate Phelps is the son of Fred Phelps, infamous pastor of Kansas' Westboro Baptist Church, an entity which asserts that "God Hates Fags," that President Obama is the AntiChrist, and that the terrorist attacks of 9/11 were God's punishment upon the United States. One of 13 children, Nate ultimately broke away from his father's extreme Calvanist teaching (and the emotional and physical abuse he asserts was prevalent in the Phelps home) at the age of eighteen. He built a new life, declared himself an atheist and is now on the front lines against Westboro, religion, child abuse, and is a strong supporter of the LGBT community. His story, plus your calls and emails (send to editor@thethinkingatheist.com).